Ground cover plants are a great way to cover more space in your garden and landscape. They are also useful for small spaces and for places where other plants won’t grow. They can help with any erosion problems that you may have in your yard. Of course, you need to take into consideration growth rate, height, sun or shade, type of soil, location and drought tolerance when selecting a ground cover that is right for you. You should space groundcovers 12 to 18 inches apart. I recommend planting evergreen ground cover plants for an all season effect. 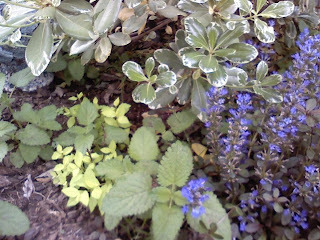 Two of my favorites are succulents such as colorful Sedums (full sun) and Chocolate Chip Ajuga aka Bugleweed (shade). Other recommendations are Trailing Juniper, Mondo grass and Liriope. Vinca, ivy and vines are also great ground covers but they tend to take over, so be careful where you plant them.